Food education is becoming the new foundation for moral and mental growth. When children appreciate what they eat, they also learn to care for others, cherish the earth and understand the value of life. It is noontime at Chengjhong Elementary School, located on the outskirts of Tongsiao Township in the hills of Miaoli County. As the school bell rings, the students crane their necks in anticipation – someone is treating them to a special dish, and they're eager to see what's for lunch. "Today we are having organic cabbage, which has been planted by class 3A. Boys and girls, please enjoy your meal," announces Kang Yi-lin, the class 3A homeroom teacher, via the school's loudspeaker system, in unveiling the day's menu. Half an hour later a row of completely empty cabbage pots is rolled back into the school kitchen. The students are proud that they have yet again posted a record of zero leftovers. The cabbage the lunch ladies cooked up for lunch was grown by the students themselves, from preparing the fields to sowing the seeds, fertilizing the growing cabbages and harvesting them. By planting produce locally, food miles – the distance that food travels from its place of production to the consumer – have been reduced to nearly zero. In the process students have gotten to know the food they eat, and learned to share it and be grateful for it. That's the core concept behind Kang's "food education." "Food education" comprises a string of educational activities about eating. Food is the source of life. So what do we eat every day? Where does our food come from? How is it produced, marketed and prepared? These questions are not only closely related to personal health, but also strongly impact various environmental issues. In 2005, Japan adopted its Basic Law on Shokuiku (food and nutrition education) to stem the Westernization of traditional Japanese food culture. The law makes food education the basis of intellectual, moral and physical education and aims to use food awareness to promote appreciation of nature and the earth. Chang Wei-chi, assistant professor at the Department of Environmental and Cultural Resources of National Hsinchu University of Education, notes that Japan is promoting food education as a national movement. While trying to revive the tradition of shared family meals, the campaign also seeks to revitalize rural farming and fishing regions and boost food self-sufficiency in Japan by encouraging consumers to support domestic farm products. In contrast to Japan, school lunch reforms in the United States were mainly triggered by the severe obesity problem among school-age children and aim to reestablish a balanced student diet. In Britain, the focus of healthful eating campaigns is on learning about food ingredients, whereas Italy promotes the "slow food movement." Each country has focused on a different point of concern, and implemented its campaign at different administrative levels. Following the scandal over leanness-enhancing feed additives in meat in Taiwan last year, the Legislative Yuan has been pushing for a Food Education Act, although the bill is still in the drafting stage. Liu Chi-wei, head of the Food Policy Research Institute Taipei, observes that today's Taiwanese place a premium on fitness and health, but they prefer to spend large sums of money on health products. "They don't know they can improve their health through the right diet," Liu laments. "This is the result of a lack of food education." Still, very often a young enthusiastic teacher can bring about unimaginable change in school. Kang is such a teacher. Among the students of Chengjhong Elementary School, it is quite common to be raised by grandparents, because parents often work far away in the city. After school and on weekends, the children spend their spare time typically in front of the TV or surfing the Internet. Although the school is located right next to agricultural land, the students are complete strangers to farm life. Kang recalls how she once mentioned the term "ear of rice" in Chinese language class. Not a single student was able to clearly explain what the term meant. Kang decided it's about time to launch a food education course. From a local farmer she rented a fallow plot of farmland of some 350 square meters on a hill next to the school premises. Under Kang's wings the students spend at least six periods per week working in the field and also devote their spare time in the morning before regular classes start and after school. Rolling up their sleeves, the students began from zero, starting by learning how to use a hoe. Two years into the program, the students have a lot of produce to show for their farming skills – cabbage, cauliflower, watermelon, strawberries, chili peppers and more. The students decide themselves whether they take part of the harvested fruits and vegetables home or whether they give them to their teachers. The remaining produce is cooked in the classroom, turned into pickles or scallion pancakes. Since the field lies outside the school campus, local senior citizens often come to help the students, passing on their farming tips and secrets in the process. Imperceptibly, the school's food education program has fostered community involvement. When we arrive at the field tended by the children, we find it artistically decorated in a way that appeals to kids. Holding up tomatoes, a little girl joyfully greets us: "The teacher says we need to talk to our plants often, so they'll be good and grow up strong." A boy next to her teasingly replies: "I'll even sing for them!" He starts to sing the tune "Twinkle, Twinkle Little Star," the tomatoes cradled in his palms shining like rubies. As the students experienced the hard work in the fields, their attitude slowly changed. At first headstrong and unwilling to do farm work, they gradually became caring and committed. "Slowly they began to learn how hard the life of adults is," Kang observes. After working closely together in the fields for a long time, the children naturally opened up and began to freely talk about their personal lives with the teacher. "Maybe their parents are quarreling or threatening to get a divorce. They're willing to talk about anything," notes Kang. In such moments Kang often only needs to lead with a short comment and the children will see things in a new light. 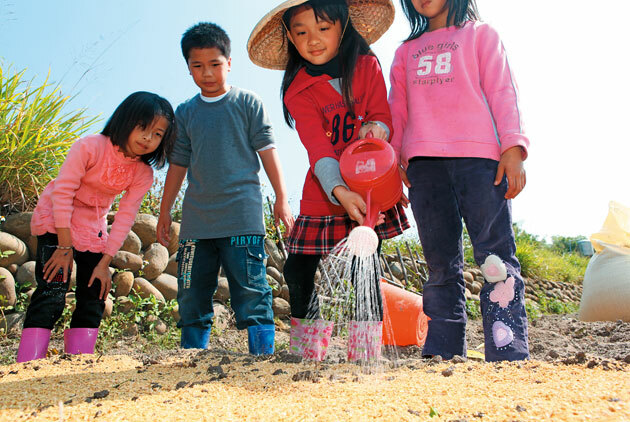 Chengjhong Elementary School has the advantage of a rich rural environment that offers ideal conditions for a hands-on gardening experience as part of food education. But how can the more than 3,000 primary and secondary schools across the island introduce food education, particularly those located in cramped, densely populated urban areas? A possible answer can be found at Yongping Elementary School in the Yonghe District of New Taipei City, one of the five largest elementary schools in Taiwan in terms of student numbers. As a first step the school laid the foundation for food education by integrating its concepts into the curriculum. The school's teachers put together a course on "healthy living and sustainability" which is taught in grades five and six one period per week. Among other topics, the course covers the dangers of food additives and the specter of a world food crisis. The teachers try their best to draw the content of the lessons from daily life and make it as concrete as possible. Teacher You Su-chu gives us an example. In Taiwan the annual dietary intake of agricultural chemicals stands at 1,500 grams per person. But for the students the mere numbers don't mean anything. So the teachers used their imagination and designed an illustrative math topic. When the students had figured out that they consumed the equivalent of one and half 1-kg bags of salt in agricultural chemicals per year, they screamed with alarm. Among students the most popular lunch items are meats, deep-fried dishes and desserts. Well aware of these preferences, catering companies design their menus around these favorite foods in a bid to win school lunch contracts. Furthermore, school kitchen staffs are not keen on handling ingredients such as fresh fruit that require more elaborate preparation. Usually they favor meals that can be cooked or fried in huge pots in one go. As a result school lunch menus lack variety and freshness. But changing children's taste in food takes time and patience. Likewise, changing the habits of kitchen crews requires some subtle persuasion. To convince the school's lunch ladies to adopt new methods of food preparation and a less meat-heavy menu, Yongping Elementary School nutritionist Lin Shu-ching employed rational persuasion, leafing through their health reports and pointing out elevated cholesterol levels and other diet-related health problems to shock them into action. She also used emotional persuasion, asking the younger students to take turns giving relaxing back massages to the hard-working lunch ladies. She reckoned that with such pampering they would be more willing to cook more vegetables. The plan worked, and the vegetable ratio on the school lunch menu rose markedly. A basic goal of food education is reducing waste and wasteful behavior. Ting Sui-chung, director of academic affairs at Yongping Elementary School, found that two years into the food education program the volume of school lunch leftovers has fallen dramatically. The school produces just 10g of food waste per person per day, roughly the equivalent of a bite of fruit jelly. That's far below the 270g average for New Taipei City. Starting with the overhaul of school lunch menus, a small food education revolution is currently unfolding in Taiwan. New Taipei City subsidizes schools at all levels if they sign procurement contracts with organic farmers. So far, more than 100 schools serve organic vegetables with their school lunches at least one day a week. By 2014 the program is expected to cover all 300 primary and secondary schools in the city to the benefit of more than 340,000 students. Yongping Elementary School Principal Lin Hui-chuan encourages other schools to seize the opportunity "to educate children about the concepts behind organic farming and let them learn how to examine where food comes from." At the same time teachers and parents must improve their background knowledge about food, so that the school diet becomes part of environmental sustainability education. Yang Kuo-ru, principal at Taipei Municipal Xinyi Elementary School, notes that food education should start with local food ingredients and emphasize energy-saving and a low carbon footprint. "If they are emotionally involved, children naturally won't waste food," Yang insists. "Thank you farmers, thank you lunch ladies, thank you teachers!" is how students at Yongping Elementary School express their gratitude before hungrily digging into their meals. The food education wave now sweeping across Taiwanese elementary schools is not about food and the environment alone. It's above all a lesson for life about learning gratitude. Next Can It Survive a Nuclear-free Future?